That notorious ‘friend to every country but his own,’ the pinko buffoon Morrissey, has just about out-done himself with his latest demented diatribe. More apposite as a question, perhaps, is – has Morrissey ever been so unabashed in his foul proclamation of his utter lack of patriotism? I’d have to say ‘yes, he has,’ recalling the Lord Haw-Haw impersonation he effected last year, when speaking in a foreign and hostile capital, just like William Joyce in the early 1940s, Morrissey declared his fellow-Britons in the Falkland Islands had no right to self-determination. But at least that abnegation of his allegiance was relatively coherent. This latest outburst sounds like it was fuelled with some form of mind-altering liquid or other substance. I mean, what does this mean? And he has the nerve to impugn the endless service to the realm of HM the Queen and the other members of the Royal Family, who probably do more in an hour or two to promote the well-being of the UK than that ignoramus has done in his lifetime of low achievement. Pity he can’t speak English. ‘Lethal to witness?’ Can anyone perceive a meaning in that? And if ‘no oppositional voice is allowed in the free press,‘ how come I stumbled upon the moron’s ravings in no less than 65 media outlets when skimming through my Google search for a day-break story? Morrissey live. Morrissey recently released a statement via his half official, half fan website True To You that slams the ongoing Olympics and British media. An excerpt of the message, which starts off with touring updates and thank yous, can be read below. 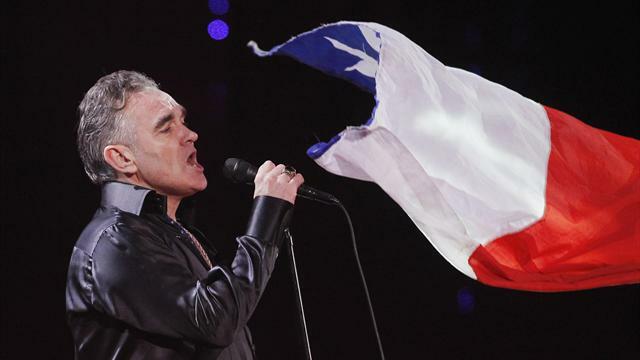 Morrissey, who fronted one of Britain’s most influential bands, published a statement on the True to You fan site: ‘I am unable to watch the Olympics due to the blustering jingoism that drenches the event. Has England ever been quite so foul with patriotism? How much does he earn? Lots! What has he done for Britain? SFA! the spirit of 1939 Germany now pervades throughout media-brand Britain, the 2013 grotesque inevitability of Lord and Lady Beckham is, believe me, a fate worse than life. Pervade the media, pervade all media, yes, but his prepositional skills are as lacking as his loyalty. Morrissey? Horrible man, horrible music, horribly immature. And horribly hypocritical. This pathetic excuse of a man can go pack his bags and F**k off somewhere else then. I would spit on him if I saw him, Our Royal family are the world leaders in setting an example and our Olympics have filled all “normal” Brits with justifiable pride. At least they are adding to their society. All Morrissey does is detract from us and belittle himself in everyone’s eyes! Go sling your hook you wingeing two faced toad, we dont want to hear your self-serving simpering pathetic views. ← Bukan Raja Dangdut Tapi Bayi Gendut! Kenapa Rhoma Tidak Nangis Waktu 3 Ahmadi Dibunuh?